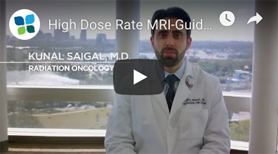 A radiation therapy patient education video to provide you with information about what to expect prior to receiving radiation therapy. A radiation therapy patient education video in Spanish to provide you with information about what to expect prior to receiving radiation therapy. In preparation for your cancer treatment, we have provided the following pre-operative educational video to help you understand what to expect during the abdominal surgery and treatment process. Please consult with your physician prior to treatment as instructions may vary from person to person. Our radiation oncology experts explain the latest innovations in prostate brachytherapy available at Florida Hospital. We were thrilled to join Ivette and her care team as they celebrated her final chemotherapy treatment at Florida Hospital. Ivette was diagnosed with cancer while in her second trimester of pregnancy. After undergoing a mastectomy and beginning chemotherapy, she gave birth to a healthy baby boy earlier this year. On Thursday, she rang the “Cancer Free Bell,” a tradition that marks the end of a patient’s treatment. Hear Dr. Mckenzie's breast cancer journey through Florida Hospital. 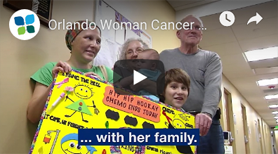 From the Florida Hospital Foundation – Your Generosity Heals. Meet Rhett Perry, an outdoor enthusiast, a loving father and a bladder cancer survivor. Watch Rhett’s story and see how a cancer diagnosis doesn’t have to change your climb through life. Learn about our gynecologic oncology program at AdventHealth Cancer Institute. Our experts discuss what they treat, and what makes our programs one of the best in the nation. Jason was a healthy, 44-year-old husband and father of three from Central Florida. After discovering a lump on his neck in 2014, he was diagnosed with stage 4 HPV-related oral cancer. Today, Jason is an oral cancer survivor and screening advocate.